iRobot, you have finally broken me. 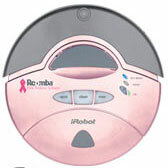 I've wanted a Roomba forever—and the new dog had almost cinched it anyway—but when you offer a pink model, for which 20 percent of the $180 purchase price proceeds go to support breasts, of which I am also a fan (okay, breast cancer, but it's against, not for it; that's pro-breast in my book), then I have been convinced. I don't know if I could live with myself if I ever passed up a deal on breast-loving pink robots. It isn't the Discovery model, however, so it's not the very latest and greatest. For me it'll do, but keep that in mind.